Where Window Cleaners, Pressure Washers & Those Entering This Business Go To Become #1 In Their Market! Be one of those that works with me and build a six-figure, cash-generating, window washing empire like mine. I'll show you exactly how to copy my success. I urge you to lock the door, take the phone off the hook, kick off your shoes, get comfortable, and STUDY this letter -- it IS that important! It introduces something THAT revolutionary! However, today I'm happy to report that I run a very strong, seven-figure revenue, deep six-figure income, automated, systemized window cleaning/pressure washing empire! are looking to get into this Business! currently own a Window Cleaning Business! own a Pressure Wash, Soft Wash, Roof Wash Business! or a Gutter Cleaning Business! My name is Jim DuBois, and I've been using, refining, and adapting my easy-to-implement, step-by-step program to make a lot of money year after year for two decades. Most people would never guess the kind of money that can be made washing windows and pressure washing when done right. But I know it's possible. And anyone can do it once you have the right tools, and my personal help. So if you've seen, or heard of people who have built $250,000 a year incomes from window cleaning, but you didn't believe it was possible ... I am living, breathing proof! I promise that you too, will be amazed at the power of my unusual yet proven marketing methods and systems implementation to virtually transform your new or existing window cleaning and/or pressure washing business from struggle or 'average' to meteoric growth and extraordinary success at blinding speed. I guarantee I can get you there. I will show you the exact steps to take to create a lifestyle of the rich, but maybe not so famous :). These are the same exact steps that I've taken. "Checked in with the admin--the crew have 4 jobs and 10 estimates today. The week is booked solid with 10 estimates+ daily. I'd wager we have a 2 week fully booked job calendar by next week....your system is magic--just needed a couple days of sunshine." "All plates firing. Your stacking technique is crazy effective. I estimate our market share is about 50% based on search volume I'm seeing." 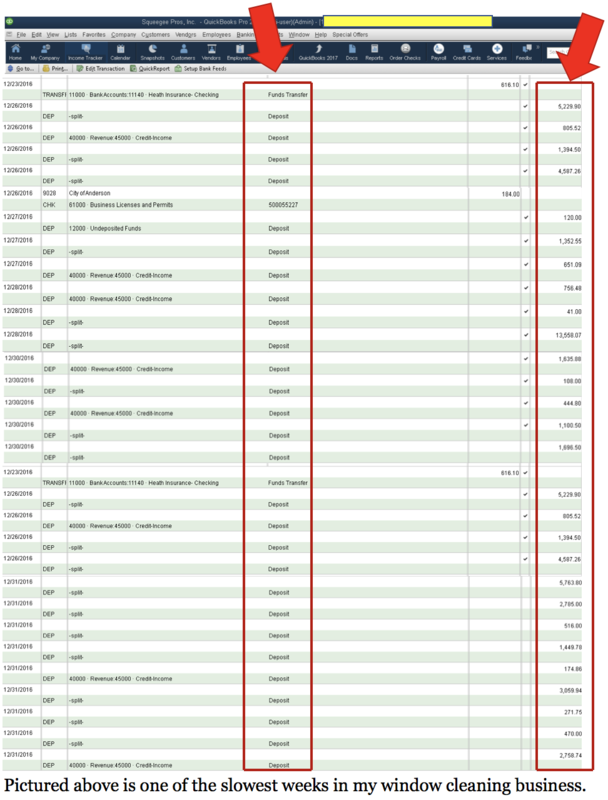 "19 jobs today for a sales total of $9,494.00! And it's WINTER! $500 average per job just like you taught in bootcamp!" "Hey just wanted to let you know that I have sold $2000 in store fronts this month while at the same time cleaning $3600 worth of glass." If you act quickly, you can put my "business wizardry" to work for YOU now, on a zero-risk basis. In this letter, I'm going to tell you exactly what my systems can do for your business. 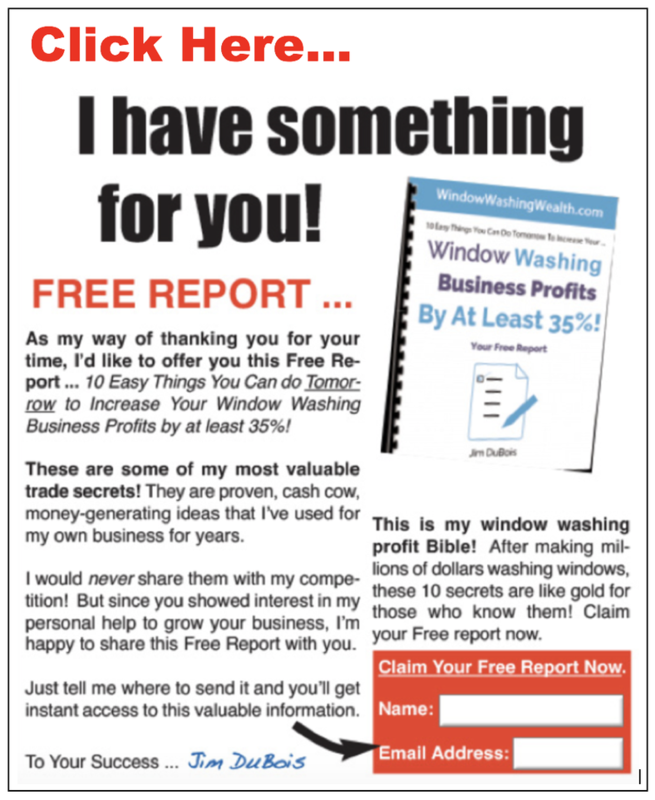 My Entire Window Washing Wealth System Completely Updated And Continually Revised -- more than 1,000 pages refined over 20 years in the making earning me millions of dollars in collective revenue. 42 Business-To-Consumer AND Business-To-Business Target Marketing EXAMPLES -- described in complete detail -- completely applicable and transferable to your new or current business. Your days of trying to constantly "reinvent the wheel" when it comes to your marketing are OVER. 184 Copyright Free Examples You Can "Legally Steal" To Create The Systems Your Company Needs To Put it On Auto-Pilot. 85% of the work is already done for you. All you have to do is effortlessly "fill in the blanks" and "move" these power documents into your business -- thus saving you time, money and headaches. This is just some of what you'll discover in my Window Washing Wealth™ System. If you want to copy what I've done and use my business as an open-book template, it's important that you are the right candidate for what I offer. Are you just getting started in window cleaning, pressure washing, roof washing, house washing, or gutter cleaning? Are you struggling with marketing and systems to build your business? Are you hitting your head against the wall, not sure what to do next? Are you currently beholden to your business and just plain frustrated? Do you have employees, but struggle with retention and turnover? Are you still personally washing windows all day, but would rather be home, or OFF THE GLASS? Are you still personally pressure washing, but would rather be on vacation, or OFF THE CONCRETE? Then you NEED what has been voted: "Americas #1 Window Washing Business Building Program". I know when you take action today by purchasing one of my programs, you'll be thrilled with the results. Because if you answered "YES" to at least one of those questions, you're in a great position to start down this road with me. Here's why. It wasn't always like this for me. I don't come from a wealthy family, and my business wasn't given to me. I built it myself from the ground up, in the trenches, starting with one single customer. My dad was in the Air Force, and I was always moving and changing schools. That is until my parents sent me off to military school. I hated it. And if there was one thing I knew soon after, it was I didn't like taking orders, and I wanted to do my own thing. I wanted my own business where I called the shots and controlled my own destiny. Except I had no idea what it would be. Until one day when I was 19, I replied to an ad in the newspaper for a window washing job. Little did I know this would be a game-changer for me. I worked for this company for one year. And I remember going to the owner's house to pick up my paycheck, and seeing his shiny new Cadillac in the driveway, the in-ground swimming pool in the back, and his big, beautiful home. Because that's the day I realized I was on the wrong side of this equation. I could do this on my own. And before long, I did. Today, when I meet new friends, they're shocked that I can afford the lifestyle I do when they find out I own a window cleaning business. They can't believe it. And every year my income grows. I don't brag or boast about it. In fact, I rarely tell people what I do unless they ask. Because it is my little cash-generating secret. You know what's really funny is people I meet will ask me what I do for a living and (on purpose) I say, "Well, I'm a window washer". And they just look at me with a weird 'I feel sorry for you' expression on their face having no idea until I hop in my new Audi sports car and drive off to my lake house. Window cleaning was the smartest decision I ever made! And this, right here, right now, could be a game-changer for you too ... if you decide to let me help you build your own window cleaning/pressure washing empire. Listen, I know what you're going through right now. You've likely been a VICTIM -- constantly wasting money, not really knowing what works and what doesn't, and constantly reinventing the wheel too often, and -- to be blunt -- getting where you're going by paddling faster and harder, without a fail-safe navigation system. Well, I'm here to tell you that this will no longer work. You can easily be defeated much faster in this New Economy by NOT KNOWING HOW TO SYSTEMATICALLY, efficiently, affordably build your business. If you are willing to be honest and admit that you are "unsure" of how to successfully get your business started, or don't really have your business "put-together", then you are going to count this as the most important letter you have read this year. I am ready to teach you exactly what I do, step-by-step to make the kind of money I'm talking about, without the 70-hour work weeks or long hours on tall ladders. Part of my system comes down to this: tell me where you want to be in revenue say in 1 year (like $35,000/m) and I will give you, the 'what you need to do', the blueprint on exactly how to get there. Then WE go to work to get you there! 250 pages and 5 DVD's of nothing but window cleaning Business Fundamentals: proper operations set-up, proper bank accounts set-up, understanding insurance, branding/image, phone/VM etiquette, software that works, the markets to penetrate, mastering select skill sets, pricing, and so much more. Read and watch from the comfort of your home. I share 300 pages and 10 CD's of nothing but hands-on strategies and examples of what I did, still do, and plan to do to. I refer to this as my Million Dollar Marketing Arsenal. Without one and your business is doomed, with one, well let's just say it has catapulted my company into the 7 figures - dozens of powerful lead generators to hiring salespeople, internet marketing, print campaigns, scripts, acquisitions, radio, and things you've never heard of and so much more. When you become part of Window Washing Wealth™, you will be able to reinvent your business...to reinvent your life. This will become the perfect reference you'll be accessing throughout your wealth-building window cleaning/pressure washing career. Business Building Component #3: Your Guided Tour On Everything Administrative Explained In An Easy To Understand Format. 250 pages of "you must have" information to tie everything in your business together, but most have no clue as to how. They are flying by the seat of their pants. Things like organization, collections and past due systems, interviews / hiring / firing, structured technician and management pay, profit sharing, your pay and how it 'should' work, performance reviews, effective employee retention programs, and so much more. You'll see exactly how to successfully adapt and use the "power documents and methods" in Window Washing Wealth™. Please understand - systems equal freedom. Without them, you will continue to trade time for money, and you will continue to have a business that consumes you like a job. Who wants that? With 300 pages that explain my "enforced systems" you will quickly see why and how you will turn your business into an auto-pilot machine - documents, agreements, handbooks, employee manuals, pdf's, contracts, office forms, filing systems, etc., etc, etc. Just like Michael Gerber explains in his best-seller The E Myth, everything is here to turn your business into a world class company. My Company Becomes An Open Book! But don't let this overwhelm you. It is laid out like a filing cabinet, you open the drawer, take out the appropriate folder, and select the document you want when you need it. This is like being a fly on the wall in a 7-figure operation and seeing everything we do in action day after day. 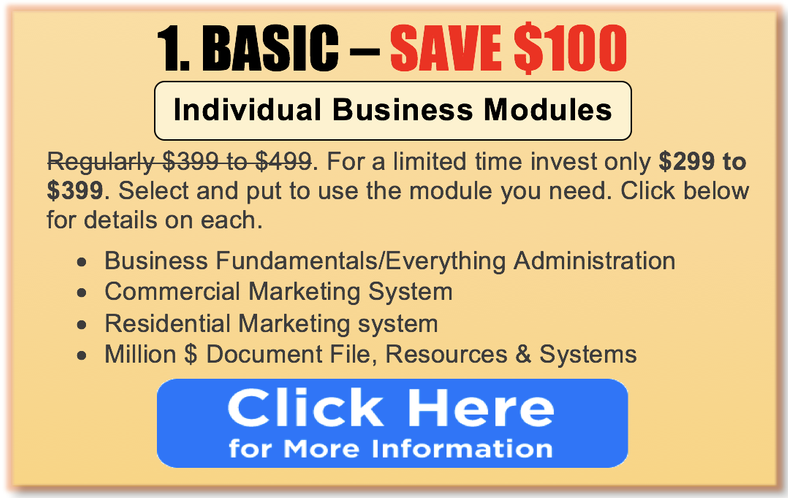 This is a 1,000 plus page series of binders broken into 25 well-organized, step-by-step sections, with videos, and an audio program that completely details how to build the kind of business that dominates your market like no other program offered today. It is an amplified everything version of what I have done to build my company, Squeegee Pros, Inc. out of Charlotte, NC into what it is today and what it will become tomorrow. I would put it up against any Fortune 500 Systems Manual. 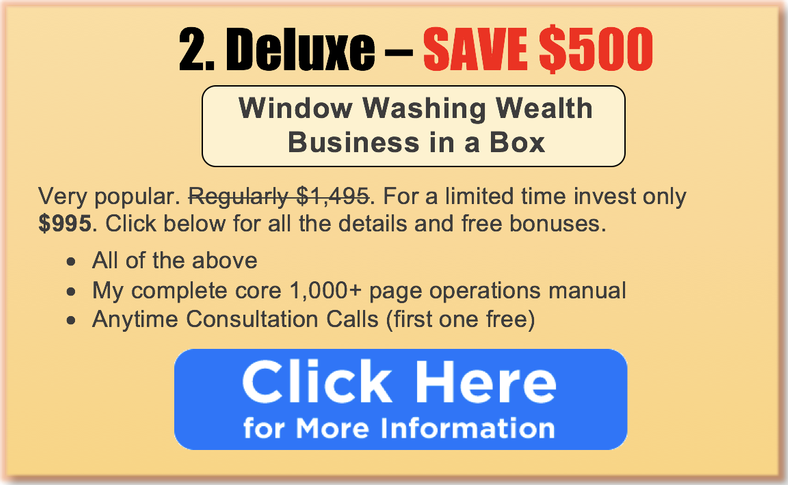 If you desire to build a big business, a serious business, with a strong income to boot, you need Window Washing Wealth™. Period! When it arrives at your doorstep and/or via online portal and you flip through the binders of information, you'll realize all the HOURS of time Window Washing Wealth™ will save you, along with the days of "false starts" and YEARS of trial, error, and testing you won't have to endure. Everything here is exactly what I did, and what I still do today. And I can teach you to do the same. Heck, you can even call me, text me, or email me whenever you want. I'm here to help! I have assembled a product and support program like no other -- yes, it includes 3-ring binders, audio and video, but you MUST NOT prejudge it because of that. This is actually a complete "Business Building Methodology".... real tools you take and use in your new or current business. All is contained in my Window Washing Wealth™ program. You might think of it as a complete, systems implementing, business transforming, marketing department in a box, with so much more. And you are not left alone to fend for yourself like most other programs. I'm just a phone call away during business hours to talk with you LIVE! 3. Low and Mid-Rise Buildings accessed by waterfed pole or man-lifts. **And by the way, if your business is primarily pressure washing or gutter cleaning you can apply the exact same principles for success! Just insert the word 'pressure washing' or 'gutter cleaning' where it says 'window cleaning' in my programs because the concepts outlined all apply. Anyone can wash windows or learn to pressure wash... But very few know the business-building marketing secrets that make you financially secure doing it. It won't take you 5 or 10 years to reach a 6-figure income level. I will show you how in just two to three years starting at ZERO. I want you to understand something, I'm not trying to sell you a $39 manual or report that covers the basics of window cleaning or pressure washing. I'm willing to SHOW you myself how to strategically build an operation, just like mine. All you need is the willingness to follow my lead. And depending on which Window Washing Wealth™ program you choose, I will take you by the hand, and work with you side-by-side until your goals are reached. As I said, my window cleaning business today is on auto-pilot. Now I spend most of my time teaching people like you how to copy my success and catapult up their income. Years ago, I fine-tuned my system by first teaching my dad, my friends: Tony, Ralph, Joe, and Frank to do what I'm doing. All of them went on to build successful businesses. I have a friend in NJ and another friend in MN who both make more than a good attorney, simply by implementing what I've been talking about. And in case you're wondering, you won't even find another industry "specific" coach, and mentor like me in the U.S. I am the very best at what I do. I'll make sure you succeed. Now, does everyone make this kind of money? No, of course not. In fact, most don't. But that's their choice. Those in the window cleaning/pressure washing business know it's not hard to make a decent living of $50,000 or $60,000 a year. But very few know the right approach, the secrets, the strategies, to make the big money. And that's what I do best. But, that's NOT what everyone wants to do. Some are happy to simply take my knowledge and double their income to $90,000 or $100,000. Not just more money. But also a lifestyle others are envious of. Who really wants to wash windows 5 or 6 days a week, for 10 hours a day? Not many people I know. Instead ... Consider this ... As much as I love window cleaning and pressure washing, what I love more is only working two or three days a week and vacationing every two months. On the other hand, I know many 9 to 5, college-educated professionals who are jealous that I make more than they do, and only work half the time. Imagine taking a new approach to building your business and turning it into a lifestyle that others dream about? It is real and very possible in this business. Yes, you ARE looking at the right business! Now you just need to play bigger... with my help! Everything I'm talking about here is absolutely 100% true. And It literally works anywhere. Have I made mistakes along the way? Of course. But I've taken those mistakes and fine-tuned my system, so you won't have to, saving you time and money. Ask yourself this: Do you really want to trade time for money in a business that's really just a "job"? Or ... If you accept my help, and implement my system in your city, where do you think you could be in 1 year? And as we keep working together, in 2 years, or 5? Think about that. 1. You will have a consistent, six-figure year-round income. 2. You will have the option of working only a couple days a week. 3. You will have a business that goes on with or without you. 5. You will no longer be trading time for money. This does NOT require that you work harder, longer hours. In fact, I will show you how to achieve success by working LESS hours. If you suspend your skepticism and keep reading every single word of this message, you'll discover how to follow in the footsteps of those that have made it to the top 5% or even the elite 1%. Glass is everywhere - look around. Concrete and wood surfaces are everywhere too. No age restrictions sixteen or sixty, this is a business where age is not a factor. No expensive training, diploma or college degree required. Very low operating costs at literally pennies a day. Get paid the same day you perform the service. Enjoy the satisfaction of being your own boss. No experience required - anyone can do it. And you'll meet some very interesting people. You can learn the basics of window cleaning or pressure washing in just a few hours. In fact, I teach people in 20 minutes how to efficiently wash a window. Easy to learn, and easy to put into action. At the same time, this isn't a "get-rich-quick scheme." You're going to have to commit the time necessary and break through that wall that may be holding you back to achieve the level of success you desire. I CAN'T provide you with the desire to succeed. But I CAN provide you with a proven business building blocks you can use to streamline your efforts with systematic, step-by-step instructions. If you're only looking for part-time work, a couple thousand dollars a month income, that's easy with my program and I can get you there ... fast. But my course was really created to make you very, very successful. It was created to do what other window cleaning companies can't, or don't know how to do. 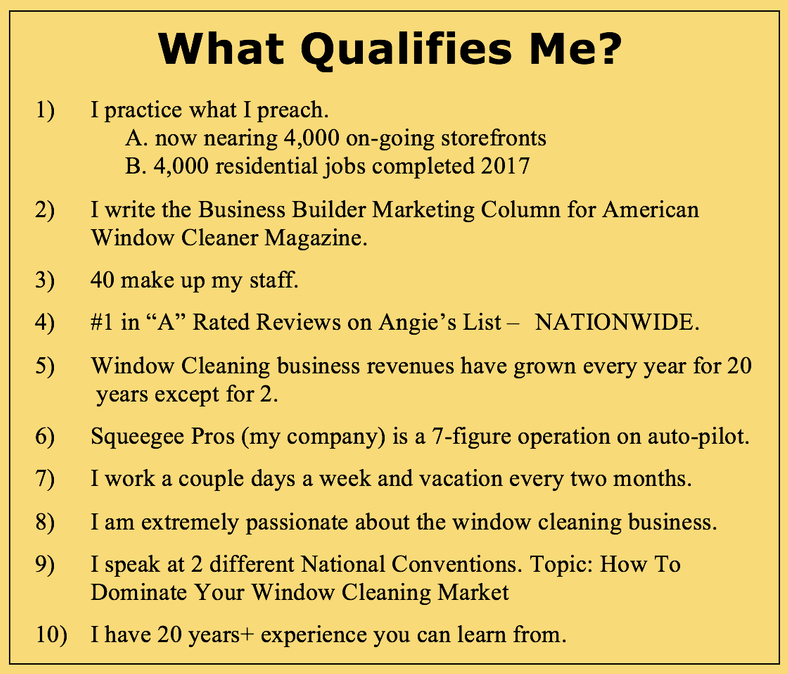 There's no manual, book, franchise, consultant, or report that can or will do for you what my Window Washing Wealth™ system can. There will always be competitors, and that's good for business ... But only ONE can dominate, and be in first place. And it might as well be you. This is what I teach you. Which means your competitors won't always like you, and some may even fear you. As of today, I have eliminated 17 of my local competitors, opening up my market ten-fold. So if you want what I have, you need to be able to say, "I'm going to do whatever it takes to make my business innovative and as valuable as possible. And because of that, I fully expect to win the lion's share of the business in my marketplace, and will likely dominate my competitors in the process." If you can do this, learn to market the right way, and break through the confidence gap, you'll automatically surpass 98% of your competitors, and lay the foundation to become #1 in your area. ... If not, and you're satisfied hanging out in the middle of the pack, I warn you to prepare yourself. Because when somebody else in your area takes me up on this offer, look out, the elimination process will begin. How to set the standard in the industry so prospects come to you FIRST. How to instantly communicate your selling advantages in compelling terms. How to increase the effectiveness of your sales and marketing more than 3,000%. How to take market share, virtually eliminating your competitors and monopolize your market. How to assemble a dream team, creating extraordinary results from ordinary people. How to create a never ending "Faucet of Profit." So you can turn your Marketing Dial up and down whenever you want money to stream in. New concepts that will make you stop and say, "Now, that's something I've never heard before." Learn how to market your business like a 20 acre irrigation system vs. a 1 gallon watering can. This is not a franchise. Keep or create your own company name! I teach you how to make money, and lots of it. I teach you how to get there quickly. I don't demand or dictate, only suggest and guide you to implement my proven success system, starting day one. You'll also get world-class support anywhere in the country via voice, text, and email. I teach you the 3 P's to success. Learn how to market with power, precision, and passion. More so than a manual could ever do, I literally take you by the hand. I don't just send you a 40-page manual and wish you luck. You'll have full, on-going support to become the biggest and the best in your area from me, and top leaders in my organization who have actual experience like I do. Depending on the program you choose, you'll have a huge protected territory to build your million dollar empire. Meaning I will not sell my premier program to anyone else in your market. 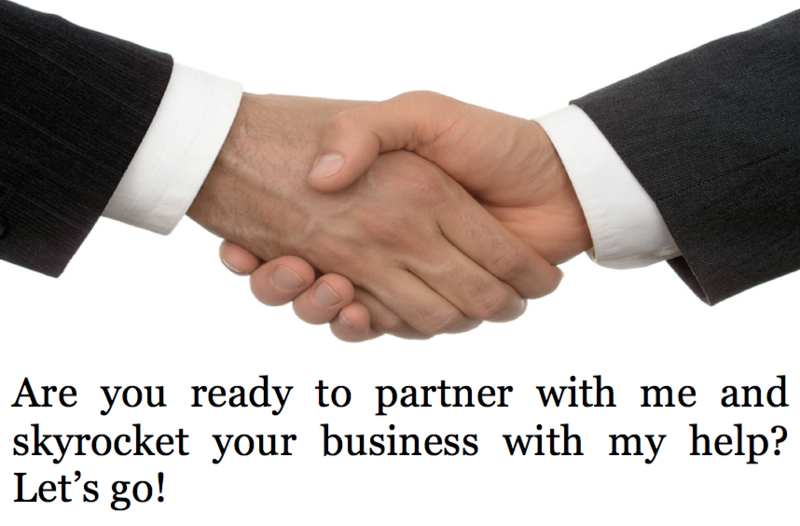 You will have marketing assistance through regional and national contracts that we will help negotiate for you. Squeegee Pros National Network provides window cleaning and pressure washing services on a nationwide scale with a high level of reliability at efficient cost points. Yes, there absolutely is a better way! You and I will become 'a team' working together day after day, month after month, and year after year until the kind of success I have talked about occurs for you and your business. How to come up with the right name for your business and why an appropriate name makes all the difference when it comes to marketing. The only way to structure your window cleaning business to reduce taxes, limit liability to create that corporate shield. The perfect window cleaning solution for just pennies per job. The types of insurance you'll need to be completely protected. There's more than one. Why you should never (or 99% of the time) bid by the hour. Four $100 an hour easy add-on services to your window cleaning business. The most effective way to give estimates that convert. The four steps to perfectly clean a window faster than you do now. Safety solutions and tricks of the trade. Crucial steps to avoid work-related accidents. Six more simple add-ons that turn into cash ... all you have to do is ask! Dozens of sample letters / emails / creatively written copy to get new customers, get referrals, and remind customers it's time for another cleaning. All ready for your use. How to earn at least $1.00 to $2.00 per minute. When and why to use a $125 minimum price strategy. When it's appropriate to ask for an hourly rate. How to get paid for your time driving between jobs. How to correct pricing mistakes without taking a loss. Eliminate bidding mistakes - Forever! Have a question about bidding a particular job? Need help troubleshooting a tough job site? Have a question about equipment and tools? Just ask... My staff and I will be there to help you every step of the way! One little secret to turn your company's business card into an effective marketing 'secret weapon' to get commercial and residential jobs. Yellow Pages still exist. How to easily dominate the directory and 'own' a specific target market. How to charge top dollar in your residential pricing - a $5,000 trade secret. How to find the 'perfect' price in your home town. Don't make these bidding mistakes ... 12 tips to save frustration. Our unique paperbox flyer brings in thousands of dollars in new business over and over again. An unusual thing we do to make money by giving away our cleaning services. Use 17 proven, high return, little known marketing concepts that I use in my business. The words to sell any job over the phone with my exact, spelled out word for word scripts. Then, how we "WOW" the customer like no one else does. I mean no one! Know how to use the written word for brochures, direct mail pieces, postcards, voice mail, website, etc. to get your phone ringing and converting into revenue. You'll learn how to do a quick evaluation on your company against the claims your company makes. Anybody Else But You ... Regardless Of The Price!" Make sense? If your business today doesn't get that kind of reaction, then it's not working right. Listen: there's a lot of noise out there surrounding business and marketing. It's mostly the "blind leading the blind" when it comes to determining whom to listen to. 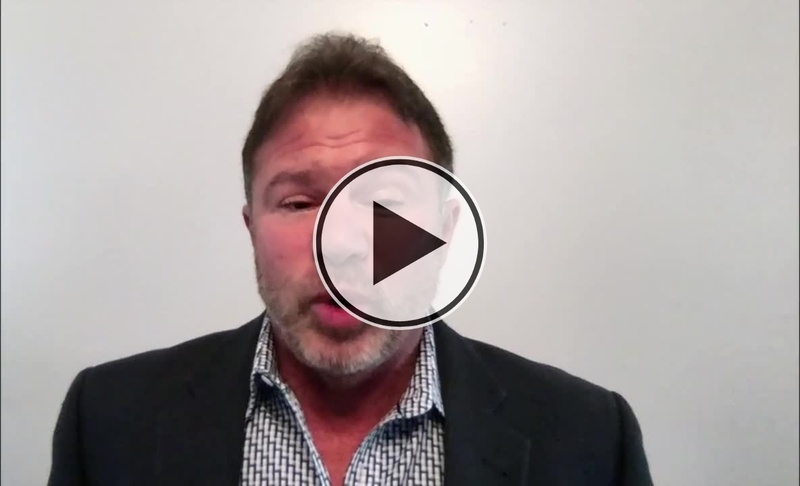 I want to give you 3 criteria or elements you absolutely, positively must have before you invest in any system. 1) Does the course offer free tools you can take and use immediately? A lot of courses and books contain nothing but strategies and ideas and leaves you on your own to "figure it out" for yourself. Instead of teaching you to fish, I decided to just give you the darn fish by giving you templates and examples you can easily "swipe and deploy" into your business to speed implementation. 2) Does the author have actual experience in the field? A lot of marketing and business how to books are written by people who have never been in the trenches. I've been in this business for two decades and have staff that have been with me 10, 12, and 15 years. I teach what I'm talking about at 3 different industry conventions. You may have heard of me. And I've been helping clients with my Window Washing Wealth™ programs since 2017. I continue to pull things out of my "idea pipeline" to implement new concepts, new marketing strategies, and more. I have bottled up what I've learned over the years and put them into my Window Washing Wealth™ System. 3) Does the person selling the book have REAL results backing up the program? Super important. 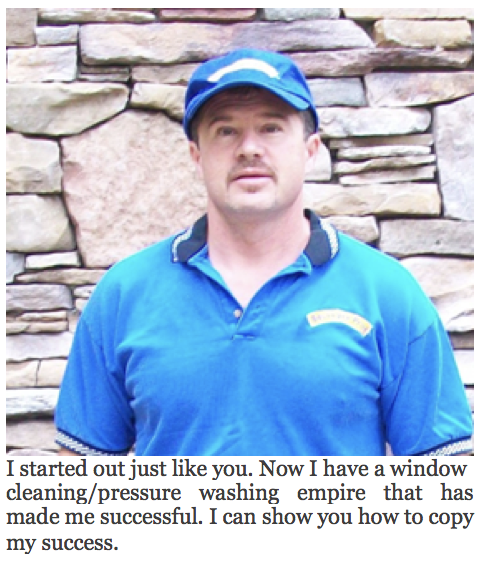 Click below to read what more Window Washing Wealth customers have to say. Option #1 is to simply discard this information (close this webpage) and walk away. Forget all the information you learned about why dominating your market leads to a $250,000 income, while working only a couple days a week. You'll go back to living your same life, struggling to grow your company to the size you 'really' want, working 40, 50, and 60 hours per week. And the truth is, if you do nothing... well then, nothing will ever change. Why haven't you done it already? Or have you? And the truth is, life will get in the way like it always does. Things will come up and you'll end up more frustrated than ever because you had an opportunity to build a window cleaning dynasty, but you passed it up to save a few bucks that would have changed your life. And then you find out that someone has "claimed" your area. Option #3 is you can make the easy decision and let me and my team guide you to the success you want. In just a few hours, you can have all this knowledge at your fingertips, instantly putting this invaluable information blueprint to work. You'll have a step-by-step action plan ready, and a success-driven team right by your side every step of the way ... So you can wake up tomorrow morning with a breath of fresh air knowing you will NOW have the tools you need to build a multi-million dollar operation. And just to be clear, we are NOT a one-stop shop marketing company offering all things to all businesses. We are a window cleaning company, that only teaches business owners how to build huge window cleaning/pressure washing businesses. You'll Get At Least 10X Your Money's Worth! Comprehensive marketing systems like Window Washing Wealth™ can cost $10,000 and more and none can hold a candle to this system. You could certainly spend $10,000 having a business consultant or coach create just one philosophy for your business. I know, because I did. I hired a business consultant over a 3-month period and it cost me exactly that and worth every penny. You could invest $35,000 in a window cleaning or pressure washing franchise and get a name, brochures, a small cookie cutter territory, with a never-been-in-the-trenches amateur supporting you. And still not have anything close to what my system offers. Do you know how many window cleaning franchisees go out of business? Something to research. 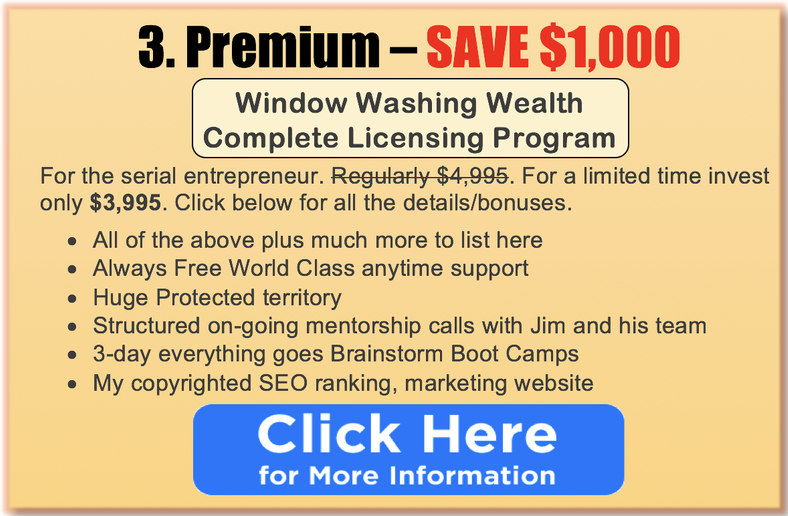 "The Window Washing Wealth™ program/system is worth 10 times more than what Jim is charging. If you're on the fence about purchasing it, I would do it now before Jim realizes he's not charging enough for it ...The strategies alone that I got from my first phone conversation with Jim will pay for my investment in The Window Washing Wealth™ program 10 fold. Plus, Jim is a really nice guy too! He's someone whom I look forward to working with to help me reach my goals. Wash On Jim!" If you like what you see and hear, I have just the program for you. Let's get you started TODAY! And don't delay! Another year will go by quickly. If you apply yourself, follow my suggestions, and use just one or two of the ready-to-go campaigns in this program, the additional business you'll get will easily give you a hundred times return on your meager investment. ...and get ready to have your phone ringing off the hook, your website flooded with traffic, and your inbox filled with new customers. Here's your chance to make more money than you've ever made before while building your business right! Thank you for your time and for considering Window Washing Wealth™. The window cleaning and pressure washing business has been very good to me and my family. I couldn't imagine doing anything else. P.S. This is your first step to financial independence in the greatest enterprise I know of, the window cleaning business! The next 5 years are going to go by anyway. Are you going to spend those 5 years worrying about your business and fretting about money 7 days a week? Or are you going to spend the next 5 years attracting, and building a systemized, automated, revenue generating business dynasty? You'll be on your way when you order Window Washing Wealth™ today. P.P.S. I know you don't know it yet, but there really is no downside. The only risk is that if you wait, I will fill my allotment of people I can work with one-on-one. Myself and my team are ready now to help you every step of the way. I'll be delighted to hear from you, then work with you to build your empire too. Join us! Question: Is it really necessary to have a mentor to build my business to 6-figures? 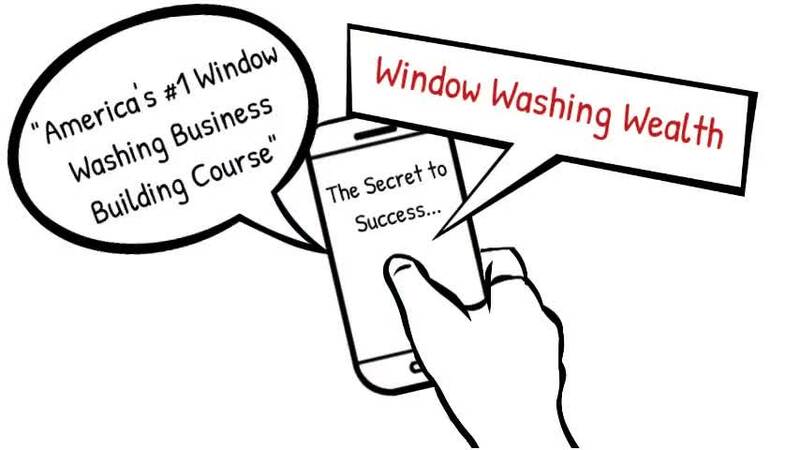 Anyone can be a window cleaner and you certainly don't need my program to be one. But to be incredibly successful, proper guidance absolutely speeds up the process. I only work with business owners who truly want to rise above the rest, following my proven business plan. I have 20+ years of knowledge and have already 'done it' in our market so it makes it easy for you to copy and follow my lead. As far as the window cleaning business, we are in a niche service industry that is recession resistant with limited 'real' competition. My training and support offers you the potential of a significant six figure income. A process remarkably harder if attempted alone. Question: I'm already in my 50's. Is it too late for me to start working with you? Absolutely not! I can have you up and running inside of 30 days making money. My "take you by the hand" approach and day-to-day support will have you making more money quickly. And within just a few months to a year you'll see significant changes to your income - provided you do your part. This is not a 5 or 10 year plan to break even and finally profit. Plus, my approach is to have people doing the work for you so you can work on the business instead of in the field every day. Question: Do I need any special background to work with you? No, we provide full training and support, and the tools you need to build your company. From software, to marketing, to employees and everything in between. Our training is thorough and extensive and is taught by the top tier of people at Squeegee Pros, including myself, the founder. You just bring the willingness to succeed. This is a very important question because this is where 99% of programs fail. Our Operations Manual is the bible and core to our program. That combined with our world-class support lays out in finite detail exactly the 'what to do' and 'when to do it' from day 1, to day 10, to month one, to year 1 and so on. As I stated earlier, tell me where you want to be in revenue in the next year and beyond and I will design the blueprint, the "how-to" to get you there. Then just implement it. Question: Can I keep my job and still work with you? Yes. Our program is designed to help the part timer get out of their job as quickly as possible. On average, this is within 90 to 180 days of starting, and then the sky is the limit. This is the beauty of our system. We realize not everyone can jump in full time at 40 hours per week and we don't expect you too. However if you can, all the better, as you will expedite your business success. Question: Do I need an office? No. Most of those I work with, and myself, started out at home before getting an office outside. But we do want you to have that goal once you become financially sound. Success seems to build on itself faster with an outside office. We know where the best offices are found. And we have a proven method to help you find great office space at the best lease rates. What will I get if I choose to work with you? Depending on the program, you will receive a 14 pound box containing all our written material, operations manuals, DVD's, audios, proprietary forms, and more, organized in an orderly, step-be-step format. In addition, there is my online Window Washing Wealth™ portal (with even more) to learn on your phone, tablet, or computer when on the go. In short, World Class. We are extremely committed to providing an unparalleled level of support, instruction, direction, and leadership. One-on-one support will consist of many forms including phone, in person, text, and email. Other forms of support include Boot Camps, webinars, gatherings, and podcasts. High levels of support are provided in all areas including: tech and software support, marketing, human resources, growth and business planning, pricing, skill sets, employee management, etc. Is there a cost involved in working with you? Yes. As the only company in the U.S. that operates this way, helping window cleaners and pressure washers greatly expand their business empire, my time, and my team's time is very sought-after. So there is a cost for our time, materials, system, and ongoing support. But I can guarantee you this: It will be a drop in the bucket compared to the profit you will start seeing with our help. Guaranteed. How does Squeegee Pros differ from its competition? First of all, we have no real competition. You will find companies who offer you a franchise of their larger company. But we are different, and much better. According to extensive surveys from our commercial program customers, the number one reason they choose Squeegee Pros over a franchise is year-round unprecedented reliability. And according to residential customers, it is an extremely professional company doing a superior quality job that goes beyond the call-of-duty. Remember above when I mentioned "World Class Service"? They trust we will send professional and friendly window cleaners to their homes and establishments who focus on attention to detail and great customer service, staying on-site until the customer is 100% satisfied. We teach and show you how to do it exactly as we do. Something a franchise will not offer. Their only concern is getting your fees each month. There is much more glass (and opportunity) on the ground than there will ever be up high in the air. Your customers will include all low-rise commercial storefront businesses and 2 to 5 story buildings as well as homes. There is glass, concrete, siding, and wood everywhere you look, and we will teach you to go after every business, every large office complex, building, shopping center, countless neighborhoods, retirement homes, condos and townhouse complexes. What if this does not work for me? It will! But if not, you are backed by my Window Washing Wealth Ironclad Guarantees. If you work hard, follow my lead, and do as we show you, failure is not a real option. There are so many different types of homes, storefronts, buildings, etc. Will you guide me on how to best price glass and surfaces? Yes, part of our training is devoted to pricing jobs. Whether training in your area or training at our facility, we go out into the field and teach you how we price both businesses and homes to get top dollar. In addition, we recommend you take advantage of our Home Office Pricing Service. By simply using a digital camera (or phone), send us pictures of pricing difficulties you have and we will have an answer for you pronto. You take the pictures and we'll help you price it for profit. Squeegee Pros has a proprietary recruiting process that offers you a proven resource to finding qualified employees. We will train you and provide you with the pay systems and structures we use, and employee support documents to help you retain good people while maximizing your company profit. Will I really experience profit results like you say with your program? Absolutely! But you have to bring 4 things to the table to experience the results we're talking about and we will provide the rest. 1) A true, burning desire to work as hard as it takes to get there, putting your head down and focusing until each target and goal is achieved. 2) A passion and excitement for the business and its potential. 3) An unwavering commitment to succeed, allowing no one to shake your faith especially when the going gets tough. 4) Be willing to step out of your comfort zone and do the uncomfortable. True business success comes from doing what most won't. Thank you for your time! We are committed to your success today, tomorrow, and for as long as it takes. With our guidance and support, we won't let you fail. You will instead, join us in the elite window cleaner's world of 1%'ers. I hope to see you at the top!